The work in this exhibition is a bit of a departure from my usual large scale installations. I've been wanting to work smaller for a while, but still incorporate some aesthetics from my installation work. In all honesty, the idea stemmed from a conversation I had with Tom Sachs after a lecture I was able to attend a few years ago. I was agonizing over whether large scale work was sustainable at this stage in my career. Without hesitation, he told me to keep doing what I was doing but to find a way to work on a smaller scale. The advice was simple, almost too obvious, but I hadn't considered it because I couldn't envision what that might look like... until now. While maintaining a small body of 2-D framed paper cuts for "Dilate", I chose to create both wall hangings as well as free standing pieces that incorporate the suspension techniques I enjoy executing. Shown above are a few process photos of the various pieces I just described. 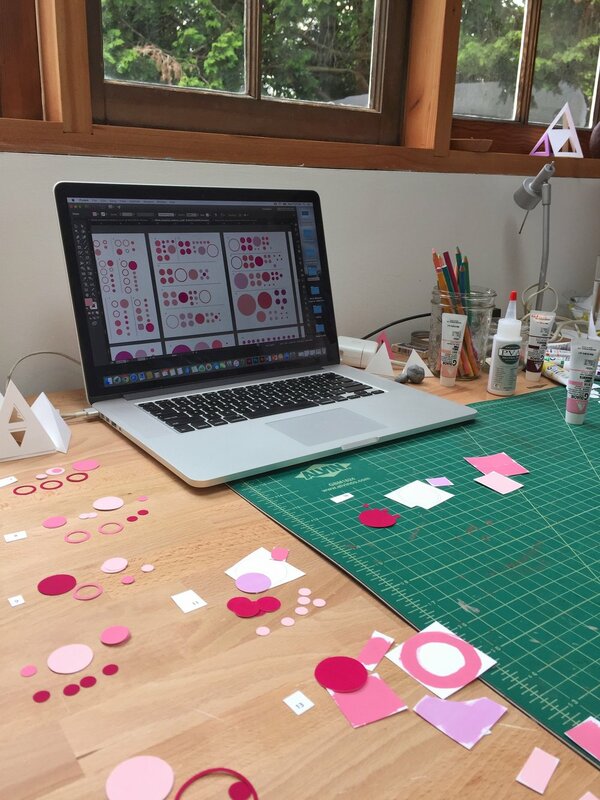 The third photo illustrates the first pattern and color palette for "Gestation." I tinkered with this for a while, wanting to incorporate a variety of colors. In the end, both the patterns and colors weren't working. I simplified it a few times before ending up with the finished piece, shown in the eighth photo. You can see the Illustrator file in image 5. 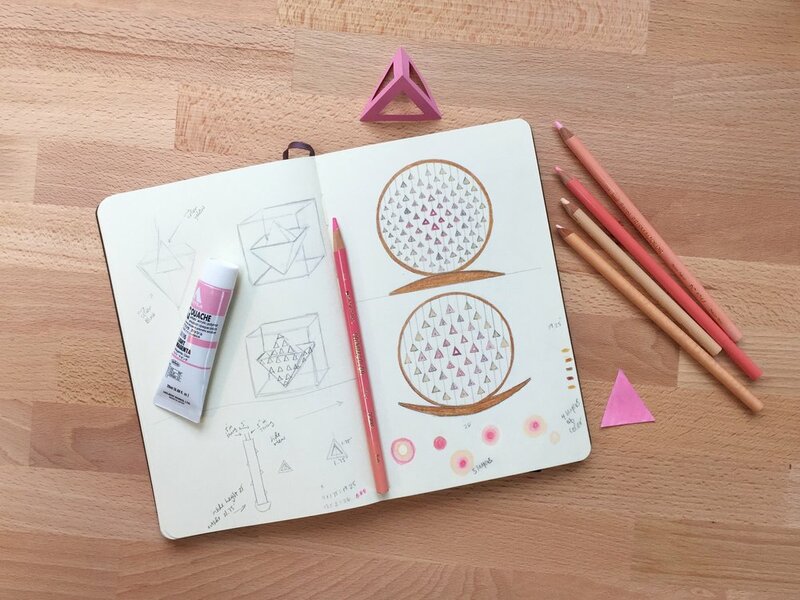 This was after I deconstructed the original layout for print and color, organizing each individual wooden circle's components for production. It was a labor of love to hand cut each circle, hand mix the colors, paint each piece, assemble and glue. I love the finished work as individual art pieces and as a whole. 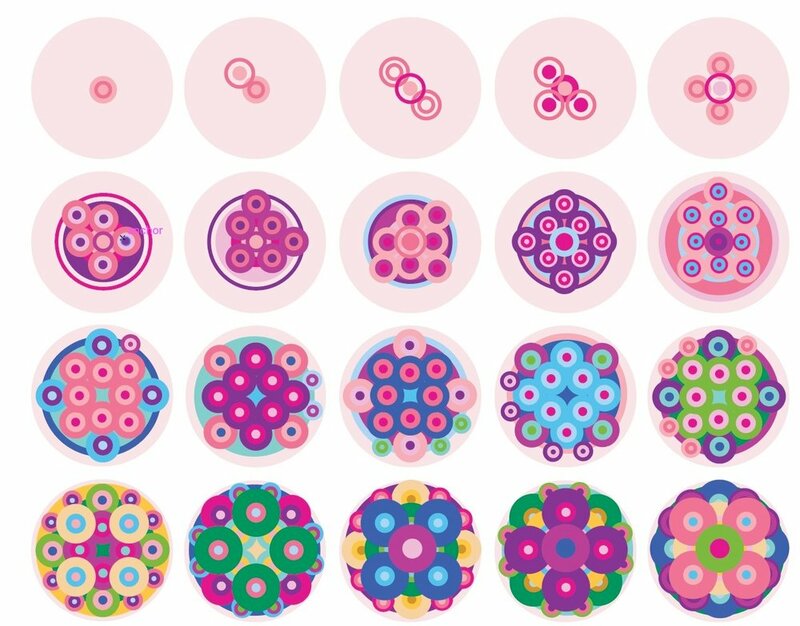 In the end the 39 circles represent the 39 weeks of pregnancy, illustrating cell division and growth. For "Womb" shown in images 9-11, I knew almost exactly what I wanted to do from the start. I chose to make the piece rock, illustrating the calming motion of the womb, a cradle, or a mother swaying back and forth. 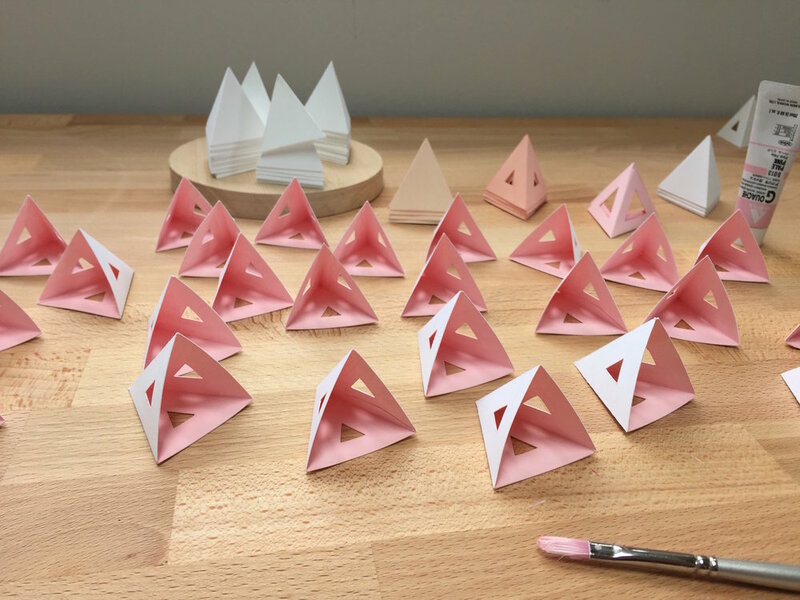 The accompanying sound of the triangular shapes gently touching one another as the work moves back and forth is both soothing and mesmerizing. The most difficult phase, besides the actual construction of the wooden circles, was figuring out how to suspend the strings. I didn't want to see the tops or bottoms sticking out and I needed the monofilament to have a certain amount of rigidity to maintain the integrity of each line. After brainstorming with my husband (my partner is art and construction) we managed to work through a series of solutions, landing on the insertion of small dowels that we could wind into place and glue from the inside. The finished piece is exactly what I envisioned--seamless.